As good today, as it was 4 years ago when I first posted it. manisha, 4 years blogging!! wow!! happy anniversary. Manisha, that picture looks gorgeous. I always thought Vangi baath/bhath is more a part of Karnataka cuisine. Wish you many more years of delightful and delicious blogging. Vaangi bhaat, nothing can beat that taste can it??? i love to have it anytime!! Happy 4th Anniversary! BTW has your main wrapper shrunk - or is it a problem with my browser? Vangi baath is so heard of, but have never tried it because of my tiff (allergy) with brinjals...somehow i can tolerate roasted brinjals well. I do want to gingerly try this out if it suits me! Lemme dig out from your archives. :D Looking forward to many more years, Manisha. Hey! thanks everyone! Although Reena, this was not meant to be an anniversary post. I was just trying to be my sneaky self and get a picture in for a 4 year old post. I was also checking out my own recipe to see if I would do anything different, given the several new influences in my cooking! But! Any reason to celebrate so let's pop the virtual champagne and have a blast! So yes, it's been 4 years but I haven't been even a teeny bit as prolific as all you folks who have started blogging in the past several years. So I raise a toast to you all instead! Paddukoti, I used my cousin's secret homemade garam masala as I was out of goda masala. And yes, it was very good, indeed! ISG, you said thingees - it's there in black on white! BTW, why do they in black and white? Those pink pear shaped delicacies are pickled pearl onions. I had a bunch and I planned to use them in sambar. Sambar never happened and the pearl onions started looking sad. So I pickled them in vinegar and salt. They are quite yummy but were quite a pain to peel! Nandita, I didn't make any changes to the template. :-( So it stinks if the wrapper appears to have shrunk! if you haven't already please switch to Firefox. I used to get an itchy tongue after eating brinjals in India. Somehow it doesn't happen anymore. The only thing I did different was add more peppercorn but that is only because we like to crunch down on them. Vee, aye! These aching bones tell many a story! And these fading eyes have seen many a tale! See, if this were wordpress, that would change into a nice graphic. Along comes Vee to burst my bubble! Wordpress - maybe in time for CSS reboot. Which is less than a month away! I won't do free hosting though. Hey Manisha, didn't mean to invoke regional issues :). Its Indian food, so its mine too :). i just was curious because except at one friend's home (who is Marathi, but was brought up in Raichur), i haven't had this as a part of Maharshtrian food. But then, how does it matter-its delicious, we all like it.....its Indian food-it rocks! I've read in a few places that the dish is Marathi, and, as the Marathi kingdom at one time ruled over an extensive area of present-day India, including part of what is now Karnataka, I'd imagine there would be variations of this dish in Madhya Pradesh, Uttar Pradesh, Bihar, Gujarat and Orissa, as well as Karnataka...the signature ingredients being brinjals, rice and a souring agent...the spicing would change. It'd be interesting to research to find out...did I mention to you the pink version with beets that I gave to Shilpa that she posted? I am surprised you don't already have your own domain. Whats it gonna be? ManishaRocks.com?? Happy 4th yr anniversary manisha. I am yet to reply to ure mail, will definitely do so today. 8 tbsps. oil? but it doesn't look greasy at all. Musical, this kind of regional is good. It's nice to understand the history of food. Since both sides of my family make Vangi Bhath, I have always assumed that it is Maharashtrian. We make more of vangi bhath than we do masale bhath. Whatever history I missed out on by not studying in India, I get to learn from Pel. The Maratha Kingdom did rule a large part of India, including the central part of Karnataka. Pink Rice with Beets? 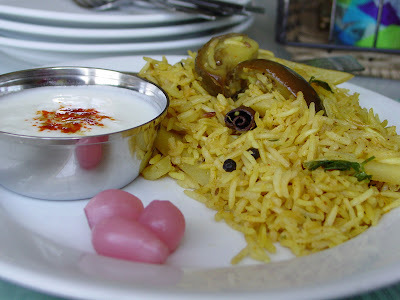 Doesn't figure in Shilpa list of Rice dishes. I do see her Vangi Bhath recipe though. Whatever. Well, I am sure it's the best pink bhath ever and if Shilpa made it, it has tohave been delicious. Deepz, newlyweds have better things to do than reply to email ;-) No worries! Bee, it is a greasier than most of my pulaos. But you need the oil to coat the eggplant pieces as well as the potatoes so that they hold their own and don't become mushy. It also helps the rice grains remain separate instead of becoming clumps. As long as it is Pel's floor, go color it whatever your mind desires! Steer clear of orange - he likes it a lot! [awakens slowly from knocking himself unconcious, blood trickles down his forehead] bring me water...water...no, bring me gulabi pulao!!! OMG! There it is! I didn't even think to look for anything besides pink and beets! Yours was the first Indian cooking blog I read, the jeera chicken post or the one about you packing food in the water cooler...one of them were the first I read. For some unknown reason, the image of vangi bhath has been coming into my head. I have never tasted this. She is at it again. Not satisfied with the kurmure panic and the overdue dvd, she is now throwing wild parties at her blog. Such parties contain everything from regional border disputes to swooning to even a split forehead turning some white rice to bright pink. There have been rumors of a lychee martinis doing the rounds but we have yet to confirm it. Oh wait, this just in. Apparently, the red liquid involved was from the crushed beets that the injured was holding at the time of the fall.No bloodshed involved. When asked the neighbors had this to say. "It's noisy but no one knows how to bhath a vangi like she does!" And with that it seems, once more she has escaped the axe.And that, my friends, is called a complete circle. Manisha you are a veteran! Congrats for the 4th. 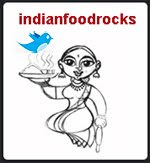 I am Archana from luv2eathate2cook.wordpress.com. And with that weather forecast, Pel, aajchya baatmya samplya! Gini, you're the sweetest! Did you see the vangi bhath on my Flickr photostream? Maybe that's why? I use that cooler trick all the time. The last time we went up to Estes Park, I had frozen milk in the cooler and I carried veggies, meatballs, cheese, bread, etc without having to worry about everything getting soggy! Archana, big welcome to you again! I had you confused with another Archana who made the slip of the keyboard. You are the third blogging Archana I know! Consider making your profile public so that we can figure out which Archana you are. Hope you're enjoying Pune! I heard it was over 40C recently. ISG, this Blogger does it to me from time to time. I've turned it on - I hope you didn't hurt yourself in the interim! %-6 (means I am brain-dead). Well, go on then...let's have it! Thanks for giving me a big welcome again . Your suggestion of making a Blogger profile,I may consider . Even I have a suggestion for you,Manisha that you should confirm the identity of the person before giving a taunting comment . Obviously the reply you gave to my comment was not a compliment and neither was it a joke.I did feel hurt. The word Infamous you used speaks for itself . Anyway I like to make things clear rather than sit and brood over it. I have no personal grudge against you.I dont even know you . Archana, true very true. However, if you notice the mood of the comments, taunting is the last word that comes to mind. However, the written word can be taken in several ways. So my apologies if it came across that way to you. Taunt is something I don't do. Flippant, yes! We're having fun here but not ridiculing anyone. Its Ok Manisha,I got your point of view. That one word did cause misunderstanding . Even I believe that we are here for fun and not ridiculing anyone . Good! We're all friends again! FWIW, no-one was being called infamous or was ever labeled infamous either here or anywhere else - Archana (the other other one) made a slip of the keyboard and used infamous instead of famous but we all knew what she really meant! We tend to carry conversations across blogs and this was one of them. It's good to lighten up. We can all have a good time, then! Archana, since you love to eat but hate to cook, you should explore the food scene in Pune and do a series of posts on that. I remember Vaishali and Marzorin, and I also remember a kabab-bbq place called Boravke or something similar. I don't know if it still exists. My b-i-l would take us there whenever we visited them in Pune. Check out HKG's blog, too, as he does a great job in both Pune and Bombay. Oh Vaishali at Fergusson Road.That place I am not going to miss . I am a veg so total non veg joints are no no for me:) But I have heard of Boravke becoz my s-i-l got chicken from there. Thats a good idea of giving a post on the eating joints in Pune too and plus Mumbai. I can't resist any more. I am making it tonight. What is on top of the yogurt? Archana, so Boravke's is still there! Wow! I'll look forward to your posts! I keep making mental notes of where I am going to go on my next visit. I need to lose a lot of weight before I do that, though! Gini, just some chilli powder and cumin powder. I'd already mixed some salt into it. Get hold of Bedekar's goda masala if possible. Otherwise, use a fragrant garam masala. Also, the thinner you cut the potatoes, the quicker they cook. I have a problem at this altitude that the rice gets cooked before the potatoes do. Let me know! One question, is this an everyday meal or special occasion meal? Gini, I am so glad you liked it! Over the years I have moved away from non-stick cookware and cook mainly in copper-bottom stainless steel kadhais especially when it comes to pulaos. There is a little bit of browning at the bottom but, for me, it was mainly rice. And even though it is really oily, we all fight for a piece of it! In our family, this was not made on any special occasion or festival. But it's not an everyday meal either. It was a once-in-a-while 'treat', which I did not particularly enjoy when I was a child. I really think I am blessed to have a child who does enjoy all these flavors!